that stomach starts to grumble. and that is why sandwiches are excellent. “sandwich” could be the most vague word ever used by a chef, in that it basically just means stuff between pieces of bread. but why not embrace the vagueness? why do people who profess to be sandwich connaisseurs limit themselves to humdrum sandwich contents like ketchup, yellow mustard, and bologna? why not get unconventional with it? this sandwich was born out of the desire to have a “snack” during an all night walk. a friend and i had decided to walk to a neighboring city after work, have a beer, and walk back. about 20 kilometers didn’t really worry either of us, but i promised that i would bring some food for the all night walk if he brought some booze. he brought the booze, and i brought a few snacks. wash the chicken breast with cold water, and pat dry with paper towels. butterfly and season with a little bit of salt and pepper. lightly oil a frying pan, and once it is hot, add the chicken. cook on medium-high heat skin side down for 4 or 5 minutes, and then flip and cook for another 3. if not yet done cooking, cover and allow an additional 1 to 2 minutes. set aside and wait for the chicken to reabsorb the juices. remove the stems from the spinach and rinse with cold water. set aside in a colander and make sure that there is little to no water remaining before using. slice some onion nice and thin. remember, transparency is important. while you are at it, cut the avocado in half, throw away the pit, and remove the peel. slice half diagonally into long semi-thin slices. add wasabi and mayonnaise at a 1:1 ratio into a small bowl. throw in a dash of black pepper and a tiny bit of soy sauce for the flavor and to thin the texture. clean your frying pan. once again, add a little oil and bring to medium-high heat. add the ham a few pieces at a time. be careful, ham tends to spit when it fries, to don’t go getting your hands, eyes, or other sensitive organs too close to the pan during this step. as each piece finishes, it it aside on two to three sheets of folded paper towels. put three pieces of wheat bread into a toaster over. try not to over-toast, but in this situation it is okay if the bread ends up a little too crispy. contrast of texture never hurt anybody. while your bread is toasting, fry two eggs in the fat the ham yielded. season with salt and black pepper. slice the chicken breast as thinly as possible with a very sharp knife. assemble the sandwich. spread wasabi-mayonnaise on each piece of bread. 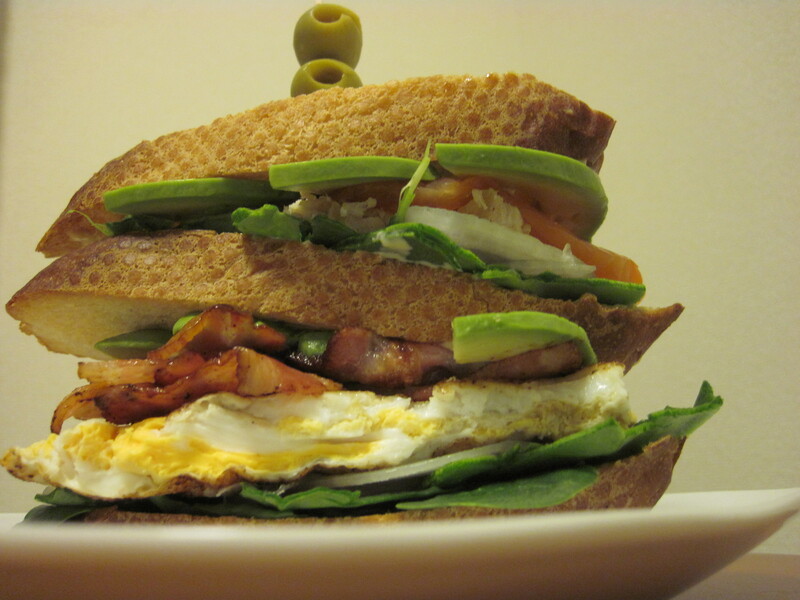 one layer at a time, add spinach, fried eggs, ham, thinly sliced onions, avocado, and spinach in that order to the bottom piece of bread. add another piece of bread, wasabi-mayo side up. add spinach, onion, chicken, avocado, smoked salmon, and spinach in that order. finish with the third piece of bread, wasabi-mayo side down. fasten with a frilly toothpick (if you have one long enough).